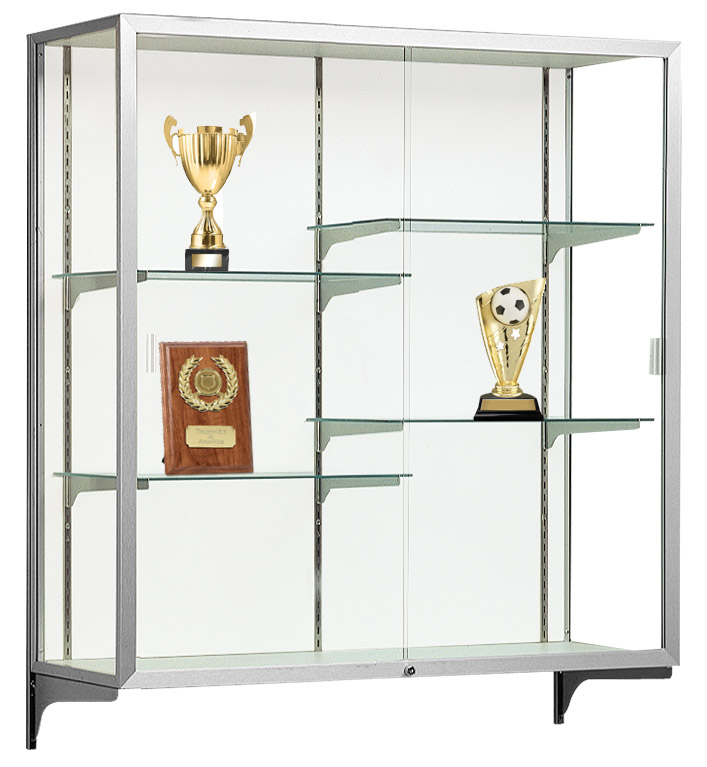 Champion Series wall-mounted cases are an excellent choice when space is limited. Ideal for schools and corporate lobbies. 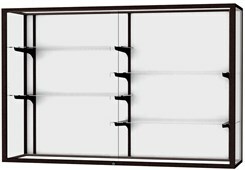 Strong anodized aluminum framing houses 3/16" thick tempered glass doors that are complete with built-in locks. 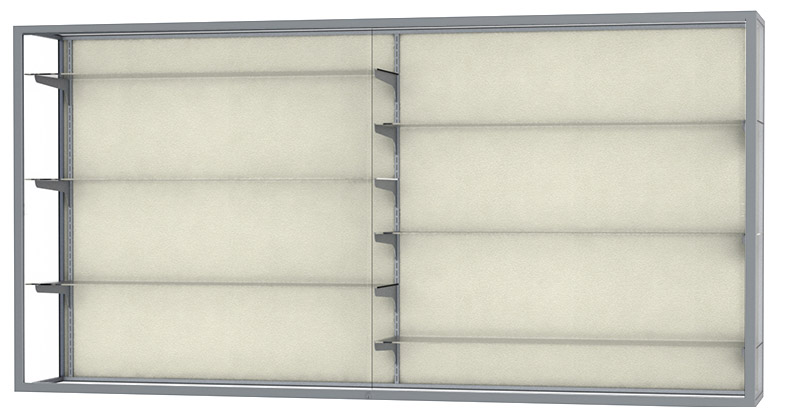 Four, 14" deep half-length plate glass shelves with adjustable hardware are included with each case. Shelves are 1/4" thick. 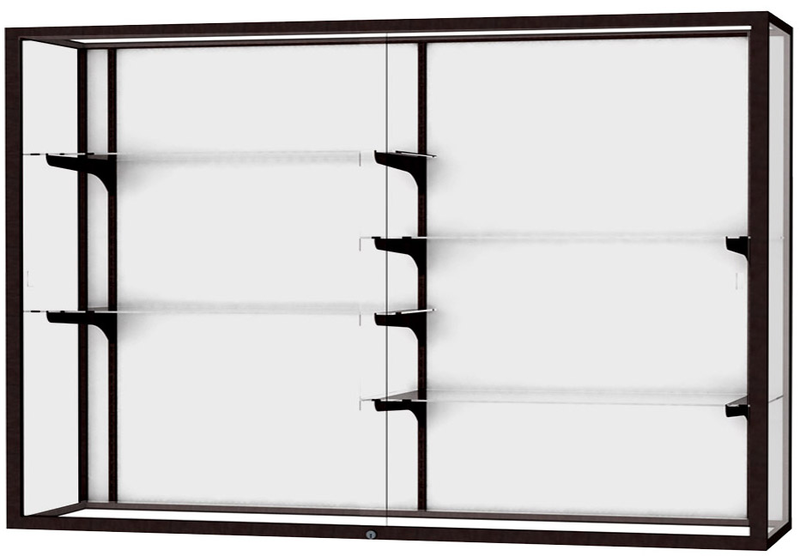 Available in three sizes, these attractive cases can be mounted next to each other to create an entire wall display. Cases complete with steel standards and brackets for secure mounting. Choice of three attractive frame finishes and three backgrounds: Mirrored for 360 degree perspective, plaque fabric for attached plaques and awards with velcro tape, or bright white laminate. 48" wide case sold above. Measures 48"W x 16"D x 48"H overall. Shipping weight 249 lbs. PRICE INCLUDES SHIPPING! (Truck shipment - see Terms & Conditions). Please allow 3-4 weeks for delivery. Measures 60"W x 16"D x 48"H overall. Shipping weight 290 lbs. PRICE INCLUDES FREIGHT! (Truck shipment - see Terms & Conditions). Please allow 4 weeks for delivery. Shown in feature photo. Measures 72"W x 16"D x 48"H overall. Shipping weight 333 lbs. PRICE INCLUDES SHIPPING! (Truck shipment - see Terms & Conditions).